The domesticated rabbit is a rare food option for most Americans. The meat is comparable to poultry and provides an economical alternative to larger animals. During World War II, the government encouraged the raising of rabbit to relieve the burden of a red meat shortage. Today the domesticated rabbits commonly distributed in the United States are New Zealand and Belgian hybrids or imported Chinese rabbits. Rabbit meat is typically available fresh or frozen. 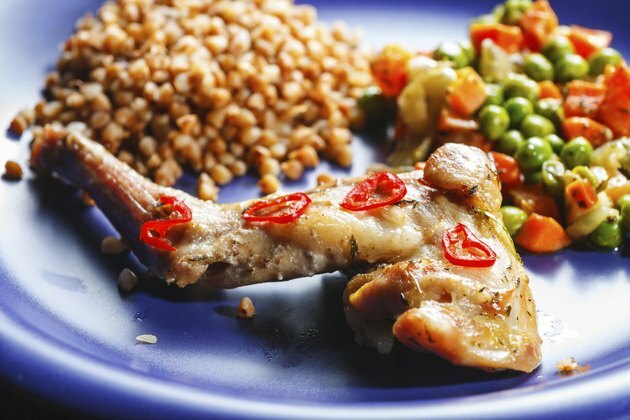 Rabbit meat is well known for its high protein content. A 3-oz. serving of rabbit meat contains 28 g of protein, more than beef or chicken. Rabbit is also a concentrated source of iron. A serving contains more than 4 mg. Additionally, the meat provides a wide range of minerals. The highest levels include 204 mg of phosphorous and 292 mg of potassium. The calories in rabbit meat are low. A serving contains only 147 calories. Today the awareness that environmental resources are valuable is spreading. The process for raising beef places a burden on grain and water supplies. An environmentally friendly solution to losing resources to larger animal production is producing rabbit meat. The environmental impact from raising rabbits is low. The period from conception to harvesting maturity is only three months, and the amount of food they eat is minimal when compared to other animals. The USDA regulates the meat. Some antibiotics are used, but the animals are tested for residues. No hormones are administered. The meat from a young rabbit is white and tender, with a mild flavor. A young rabbit, or a fryer, weighs between 1.5 and 3.5 lbs. and is about 3 months old. Chefs use the meat similarly to the meat of young chickens. Rabbit steaks and chops are served with pasta, rice and sauces. The meat from a mature rabbit is darker and firm, with a stronger flavor. A mature rabbit typically weighs more than 4 lbs. and is about 8 months old. The meat from older rabbits requires a longer cooking time and is generally used in ways similar to tougher cuts of beef. The meat adds protein to casseroles, meat pies and stir-fry dishes. The USDA regulates rabbit meat with a grading system similar to that applied to poultry processing. The Food Safety and Inspection Service inspects and approves the rabbit meat. After the meat is approved, a grade is applied to it based on its texture and quality. The grades for rabbit meat, in descending order of quality, are grade A, grade B and grade C.
Are Hormones in Meat Affecting Humans?